Q: Manmade vs. machine-made. Which is the better option for my house? A: The answer to your question depends on a variety of factors. In terms of quality, manmade rugs will always win—hands down. The craftsmanship that goes into creating these rugs far surpasses that of their machine-made counterparts. As a result, handmade rugs can last a lifetime and many are coveted and prized, like works of art. While machine-made rugs are a more temporary purchase and aren’t desirable from a collector’s standpoint, they are typically (although not always) less costly than handmade pieces and can certainly be a great option in many cases. Pets: If you have a problem pet or pets, you’ll most likely want to keep your floor coverings affordable and relatively “disposable” in case they were to become Buster’s favorite chew toys or bathroom spots. Children: If you have young children, you know that spills and messes are inevitable. While manmade rugs can always be cleaned and repaired, you may want to avoid making a serious rug investment until the terrible twos are long-gone. Renting: If you know you’ll be renting a house or apartment for just a short amount of time, pick a piece that’s less of an investment for you in case it doesn’t work in your next space. 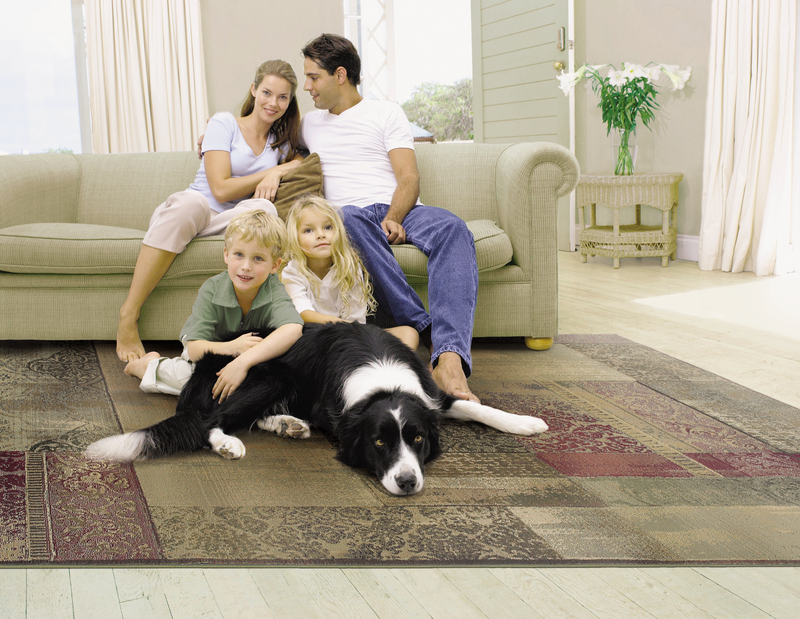 If you’re a landlord, you may want to use rugs in your rental property or properties instead of traditional carpeting. Machine-made rugs will likely save you a lot of worry and allow you to keep your properties affordable for renters. Changing trends: Do you like to change the look of your rooms often, keeping up with design trends? If so, a machine-made rug may be a good option for you. They come in a variety of contemporary styles with trendy color palettes, like the one pictured above, and are typically budget-friendly. Of course, you may have other factors to consider regarding your selection. Whatever your current situation and space, design associates at all of our locations can share more information about both manmade and machine-made rugs, and they’ll be happy to show you all of your options in order to help find just the right rug. « What is Knot Density?